Although there had been schools dated back as far as the 6th Century many Victorian boys and girls did not have the opportunity of going to school. When Queen Victoria came to the throne in 1837 education was still mainly for the privileged. Rich children might have a governess to teach them at home until they were old enough — if they were boys — to go to Public Schools such as Rugby (mentioned in the book, Tom Brown's Schooldays). The girls continued to be educated at home. Most poor children did not go to day school, but earlier, Robert Raikes had started a system of education based in churches, the Sunday School, and by 1831 1,250,000 children went to lessons in this way. That was about a quarter of the population at the time. 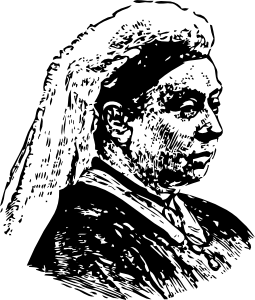 Later in Queen Victoria's reign a number of day schools had begun, including the British Schools, and the Ragged Schools (so called because of the tattered clothes worn by poor pupils). 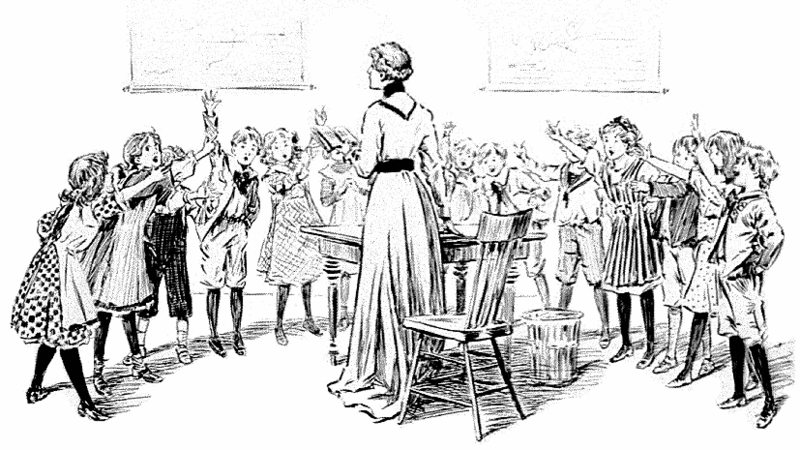 In 1870 a law was passed saying that children aged between 5 and 10 had to attend weekday school. The leaving age was raised to 11 in 1893. Even so, many children were kept away from school by parents and employers who would rather have them earning money. Many schools were quite grim places, often with windows high up so that children could not see out. They were drab by modern standards, with very little on the walls except perhaps a stern text. Boys and girls generally were separated, having their own entrance and playground. Even though in smaller schools boys and girls were taught in the same classroom they would still sit separately. Some classes were very big, for example the British School in Hitchin has a classroom for 300 boys! Village schools would have had smaller classes, but often classes had a very wide age range. Because the school classes were so big, everything had to be done in a regimented way. The teacher would write things on the blackboard which was copied into books and learned. A lot of teaching was repetition, learning the names and dates of kings and queens, or reciting the "times" table. Teachers were often strict and by modern standards very scary. Children soon learnt to do what the teacher asked, otherwise they would get a rap across the knuckles with a ruler, or a clip around the ears. Teaching was often the job of unmarried ladies (that's why you call the teacher Miss), and when you married you stopped teaching. Fewer men taught because pay was poor. Most teachers were not qualified by having a college education, they learnt "on the job" in a sort of apprenticeship. When it came to school leaving age, those with aptitude could stay on as "pupil teachers" where they would help the teacher in exchange for lessons. Some larger schools used a system of monitors. The teacher would select a number of the brightest boys and they would then be taught by the headmaster in separate lessons after school. The next day these monitors then took a group of boys each and taught them the things they themselves had just learned. 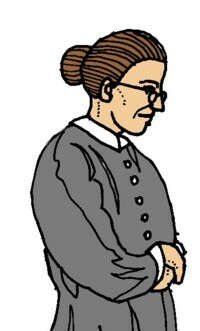 The Victorian teacher would use a cane to punish naughty children. The cane was given on the hand or the bottom, or sometimes given across the back of the legs. In public schools even prefects would carry and use a cane. All sorts of things might be punished: being rude, answering back, speaking out of turn, poor work, in fact anything that displeased the teacher. Children who had been caned usually kept quiet about it because if their parents found out they would probably be punished again. In Scotland a leather strap called a tawse was used in place of the cane. Other punishments were given including lines and detentions, and some, if not all, the deeds were written in a punishment book or log. Children who were slow at their lessons, or dumb, were made to wear a dunce's hat, a pointed hat with the letter D on it. They would then stand in a corner for an hour or more. Sometimes they stood on a small stool, the dunce's stool. At that time there was no understanding that some children had learning difficulties or learned more slowly, and teachers thought that these children were simply naughty or rebellious. Even left handed children were punished and made to use their right hand. For every teacher the most vital piece of equipment was the blackboard and easel. This could be used so that children could copy information or imitate the writing for practice. Children started to learn to write using a slate - a sort of small blackboard - on which they wrote with a sharpened piece of slate called a slate pencil. Pupils brought a piece of sponge or a rag from home to clean the slate, or some just used their sleeve! As they got older children would write in a book using a dip pen and blue-black ink from out of an inkwell. A book with ruled lines was used for handwriting practice, the copybook. The first line was printed, or copied carefully from the blackboard, then the entire page was filled with identical lines. If a mistake was made it stood out glaringly, and it is from this that we say you "blot your copybook" when you make a serious mistake. 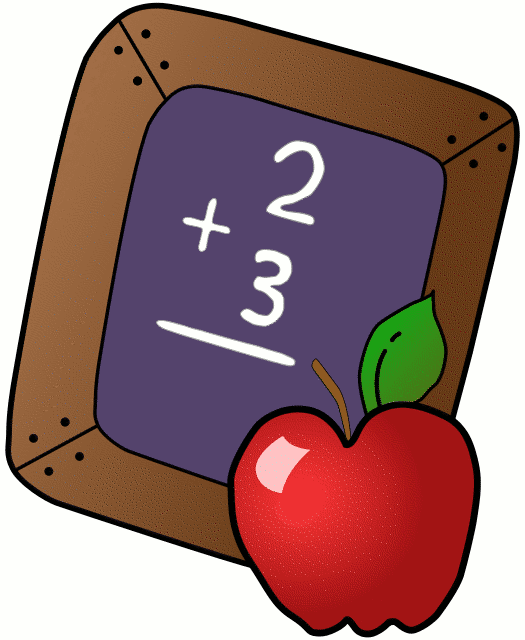 Arithmetic was performed with the help of a calculator, or the Victorian equivalent, the abacus. Those who practice with the abacus can perform calculations faster than their electronic equivalent! the teacher would show a picture of an object and the child would call out the name. Next the children might learn arithmetic. This started by learning tables, but would later include sums that were copied down and worked out. For more complicated sums an abacus (or counting frame) helped with the answer. Weights and measures were all recorded in imperial measurements: this included pounds and ounces for weight and yards and furlongs for distance. Money was also added up differently. In those days there were 240 pennies in a pound, not 100 as there are today. There were coins such as the halfpenny, the farthing, and the crown. We have already mentioned writing, and it was considered very important to develop a fine hand, so a lot of time was spent practising copy writing. Another regular activity was drill, which was the Victorian equivalent of what we now call PE. This might involve running, jumping, stretching and lifting weights, and was often accompanied by music. In larger schools each day there would be an assembly of the whole school, when there would be prayers, a Bible reading and perhaps even the singing of a hymn. Smaller schools would have this devotional activity in the classroom. During later Victorian times additional subjects such as needlework and carpentry were added, and there might even be an opportunity for nature studies or drawing of natural objects, especially flowers. School began at 9.00am and finished at 5.00pm. There was a two hour lunch break to allow enough time for children to go home for a midday meal, although in rural areas they might eat at the school. Although most of the Victorian school child's life was rather dull, the bright light was playtime. Children would play with a wide variety of toys: hoops, tops, skipping ropes and marbles. There would be games of tag, British bulldog, hopscotch, and football, played with an inflated pig's bladder. © Copyright 2009: www.victorianschool.co.uk. Permission is granted for this article to be used in full for non-commercial purposes as long as the accreditation includes the wording "© Copyright 2009: www.victorianschool.co.uk. Used by permission" is included. If only quoting small parts we would appreciate an acknowledgement.